The Princeton Applied Research Model 616A Electrode Rotator is a high precision, low mass rotator that performs well with virtually any potentiostat. When connected to Princeton Applied Research electrochemical instrumentation, it uses control lines to give a remote start/stop and speed control. 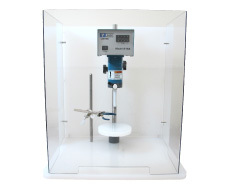 Using the convenient control panel and input jacks, the model 616 can easily be operated for either manual or automated experiments.